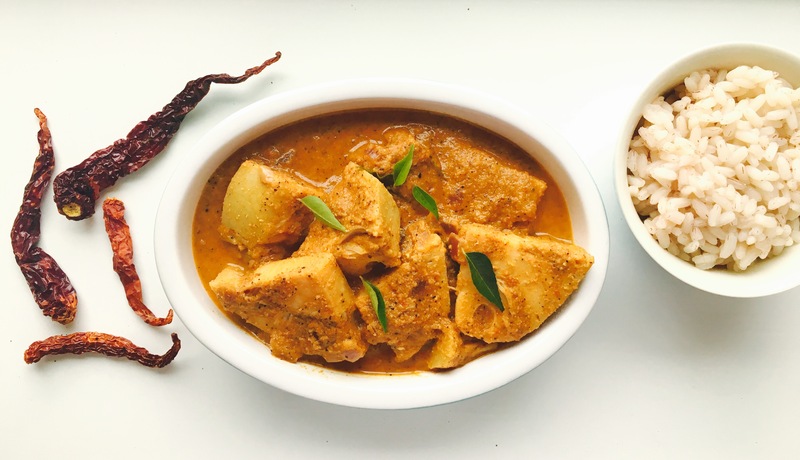 Have you tasted raw jackfruit in a curry before? I have tried it before however this was my first time cooking it. I’ve heard from some of my meat loving friends that the texture is similar to pulled pork, I wouldn’t know as I have not tried pulled pork myself. Start by boiling the tomatoes in plain water until the skin separates, once cooled peel the skin and keep aside. Chop the onion. Then add in the masala paste from the blender and on a low heat bring to a boil, add a little water at this stage depending on how thick or thin you would like the curry. I recommend not more than 150ml of water. saute and boil for about 5-7 minutes on low heat. Then add the canned/ cooked jackfruit and salt to taste. Do a quick taste check here – ensure that all the five flavours are well balanced – heat/ spiciness, sour, salt, bitter & sweet. Boil for another 5 mins and turn the heat off. Tip: Remember that grinding the initial masala paste fine is key to this curry! My mom makes jackfruit curry..But I myself never tried it as cutting and cleaning jackfruit is the toughest job comparing to any other fruit in existence..